The Gallatin River is a tributary of the Missouri River, approximately 120 mi (193 km long), in the U.S. states of Wyoming and Montana. It is one of three rivers, along with the Jefferson and Madison, that converge near Three Forks, Montana, to form the Missouri. Montana rivers. The Gallatin is in the southwest corner. It rises in the northwest corner of Yellowstone National Park, in northwestern Wyoming, in the Gallatin Range of the Rocky Mountains. It flows northwest through Gallatin National Forest, past Big Sky, Montana, and joins the Jefferson and Madison approximately 30 mi (48 km) northwest of Bozeman. U.S. Highway 191 follows the river from the Wyoming border to just outside Bozeman. The river was named in July 1805 by Meriwether Lewis at Three Forks. The eastern fork of the three, it was named for Albert Gallatin, the U.S. Treasury Secretary from 1801–14. The western fork was named for President Thomas Jefferson and the central fork for Secretary of State James Madison. The Gallatin River is one of the best whitewater runs in the Yellowstone-Teton Area. In June, when the snowmelt is released from the mountains, the river has a class IV section called the "Mad Mile". This section is over a mile long and contains continuous stretches of challenging whitewater. Rafting companies offer trips on this river – on the Mad Mile Section as well as other, less challenging sections. The Gallatin River is an amazingly scenic river – winding through high alpine meadows, dropping into the rocky Gallatin Canyon, and flowing out into the Gallatin Valley. It is an exceptionally popular fly fishing destination for rainbow trout, brown trout and mountain whitefish. Portions of the river are designated as a Blue Ribbon trout stream while the remainder is designated Red Ribbon by the Montana Fish, Wildlife and Parks Department. Parts of the movie A River Runs Through It were filmed on the Gallatin. The river is a Class I water from Taylors fork to its confluence with the Missouri for the purposes of public access for recreational purposes. The history of the canyon mirrors much of the activity during the late 1800 and early 1900s in southwestern Montana. The canyon was first explored by Native American hunters, and later fur-trappers and gold prospectors. 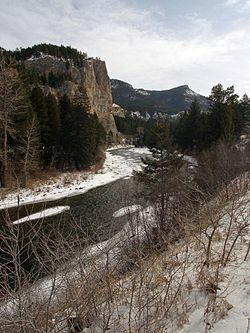 There was a significant amount of consideration given to the idea of running the railroad through the canyon to increase travel between Yellowstone National Park and Bozeman, Montana. Logging was conducted in the canyon at the turn of the 20th century, and loggers would ride the logs down river to prevent them from jamming. Pete Karst moved into the canyon in 1898 to homestead a ranch, and ran everything from an inn for travelers to serving liquor he made on the premise during Prohibition days. His most successful endeavor in the canyon was a bus route he ran in 1924 from Salesville (now Gallatin Gateway) to Yellowstone National Park. "Karst Camp", as it came to be known, was home to the first tow rope ski hill in Montana, and held annual ski jumping competitions. ^ Smith, Phyllis (1996). Bozeman and the Gallatin Valley: a history. Globe Pequot. ISBN 978-1-56044-540-1. 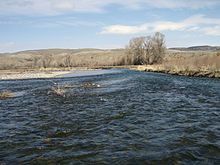 Wikimedia Commons has media related to Gallatin River.